The Flying Geckos is a Climbing Club for young people between the ages of 10 to 18 years. 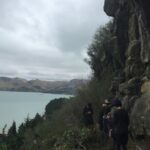 Members meet regularly on Friday evenings during school term times at YMCA Adventure Centre, Sydenham and occasionally climb at nearby outdoor venues such as Castle Hill and various Port Hills crags. Structured coaching sessions for various squad also run at other regular times during the week. The club has devised a structured programme which assists young people to develop and improve their climbing skills. 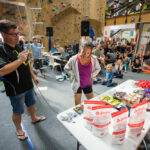 Some will participate in local, regional and national sport-climbing and bouldering competitions while others will climb purely because they enjoy the challenge and social atmosphere. The club has a strong history of developing climbers that have represented NZ nationally and overseas. Climbing and participating in the Flying Geckos builds resilience, mental as much as physical strength, and confidence of character in young people. We welcome applications from anyone between the ages of 10 and 18 who have obtained a YMCA Top Rope Belay Licence from the YMCA After School Program or gained belay approval from the YMCA if you are over the age of 13 years. See the Registration Page for more information. 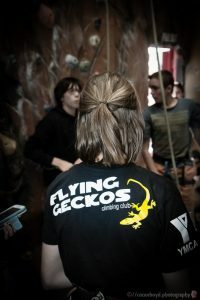 The Flying Geckos is an Incorporated Society independent of the YMCA Adventure Centre. The club is run by a committee, and programmes, camps, coaching & trips away are all managed and run by volunteers. We welcome climbers and parents in supporting these volunteer efforts by getting involved. Club income is derived solely from members term fees and from time to time grants for support when purchasing gear, and supporting trips away and competitions. The YMCA Adventure Centre also generously supports the Flying Geckos through a tiered scholarship program offering reduced rates for committed Flying Geckos members.